Nonspecific granulomatous prostatitis and xanthogranulomatous prostatitis may occur in the transition and peripheral zones, whereas postbiopsy granulomatous prostatitis occurs around the resection site and along the biopsy tract. The granulomas in systemic granulomatous conditions may be centered on blood vessels. Infectious granulomatous prostatitis may be caused by bacteria, fungi, parasites, and viruses. Fungi and Mycobacterium tuberculosis are the usual causes. Blastomycosis, coccidioidomycosis, and cryptococcosis are the most common forms of mycotic prostatitis. Mycobacterial prostatitis may occur as a result of systemic/genitourinary tuberculosis or, more commonly, as a complication of bacillus Calmette-Guérin (BCG) immunotherapy for superficial bladder carcinoma. The prostate gland is the most common site of tuberculosis in the male genitourinary tract; prostatic tuberculosis results from hematogenous spread from the lungs or direct invasion from the urethra. Granulomatous prostatitis occurs over a broad age range, from 18 to 86 years; the mean and median age of patients is 62 years. Patients with postbiopsy granulomas have a history of transurethral resection of the prostate or, less frequently, core biopsy. The epidemiologic correlations of xanthogranulomatous prostatitis are similar to those of nonspecific granulomatous prostatitis. Patients may have a history of recent urinary tract infection, intravesical administration of bacillus Calmette-Guérin (BCG), tuberculosis infection, immunocompromise, or transurethral resection of the prostate. Patients with systemic granulomatous prostatitis may have a history of asthma, pulmonary hemorrhage, rapidly progressive renal failure, or peripheral blood eosinophilia. Patients may experience fever, mild hematuria, and urinary frequency, especially patients with infectious and nonspecific granulomatous prostatitis. Postbiopsy resection granulomas are usually asymptomatic. The prostate may feel hard and nodular on digital rectal examination, and cancer is usually suspected clinically. The serum prostate-specific antigen (PSA) level may be elevated. Hematuria and pyuria may be demonstrated on urine analysis. Granulomas are localized collections of activated macrophages (epithelioid histiocytes), usually surrounded by a collar of lymphocytes (see the image below). The activated macrophages may fuse to form multinucleated giant cells. Nonspecific granulomatous prostatitis. Epithelium is disrupted and effaced by epithelioid histiocytes and polymorphs. Aggregate of histiocytes is observed within glandular lumen (left). The differences and similarities of the different subtypes of granulomatous prostatitis are described in Table 1 (see below). In xanthogranulomatous prostatitis, there is a lobulocentric accumulation of mixed inflammatory cells incorporating lymphocytes, plasma cells, and sometimes polymorphs with eosinophils (see the image below). Specifically, there are numerous foamy macrophages or histiocytes admixed with other inflammatory cells. These histiocytes may occur in sheets, giving a pale appearance on low-power microscopy. 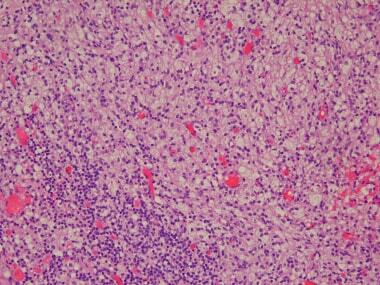 Multinucleated giant cells are seen, either scattered individually or forming aggregates, as in granulomas. These inflammatory cells hug the walls of prostatic glands and ducts, the epithelial lining of which may be disrupted. Xanthogranulomatous prostatitis. Sheets of foamy histiocytes are seen with admixed lymphocytes. Epithelioid cells are not reactive for prostate-specific antigen (PSA), prostate-specific acid phosphatase (PSAP), and pancytokeratin. Histiocytic markers such as CD68 will highlight the epithelioid cells. In xanthogranulomatous prostatitis, the foamy histiocytes are also negative for PSA, PSAP, and pancytokeratin, but they react with CD68, a histiocyte marker. Epstein JI, Netto GJ. Inflammatory conditions. Epstein JI, ed. Biopsy Interpretation of the Prostate. 4th ed. Philadelphia: Lippincott Williams & Wilkins; 2008. 22-34. 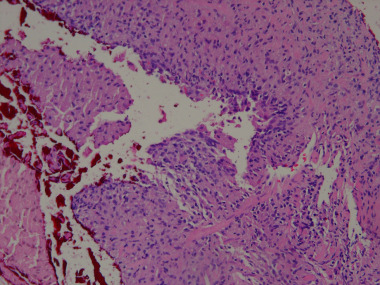 Rafique M, Yaqoob N. Xanthogranulomatous prostatitis: a mimic of carcinoma of prostate. World J Surg Oncol. 2006 Jun 5. 4:30. [Medline]. [Full Text]. Srigley JR. Benign mimickers of prostatic adenocarcinoma. Mod Pathol. 2004 Mar. 17(3):328-48. [Medline]. Epstein JI, Hutchins GM. Granulomatous prostatitis: distinction among allergic, nonspecific, and post-transurethral resection lesions. Hum Pathol. 1984 Sep. 15(9):818-25. [Medline]. Eyre RC, Aaronson AG, Weinstein BJ. Palisading granulomas of the prostate associated with prior prostatic surgery. J Urol. 1986 Jul. 136(1):121-2. [Medline]. Hussain SF, Baker JT, De Bolla AR. Wegener's granulomatosis presenting as granulomatous prostatitis causing urinary retention. Br J Urol. 1990 Jan. 65(1):104. [Medline]. Bray VJ, Hasbargen JA. Prostatic involvement in Wegener's granulomatosis. Am J Kidney Dis. 1991 May. 17(5):578-80. [Medline]. Oppenheimer JR, Kahane H, Epstein JI. Granulomatous prostatitis on needle biopsy. Arch Pathol Lab Med. 1997 Jul. 121(7):724-9. [Medline]. Presti B, Weidner N. Granulomatous prostatitis and poorly differentiated prostate carcinoma. Their distinction with the use of immunohistochemical methods. Am J Clin Pathol. 1991 Mar. 95(3):330-4. [Medline]. Epstein JI, Egevad L, Humphrey PA, Montironi R, Members of the ISUP Immunohistochemistry in Diagnostic Urologic Pathology Group. Best practices recommendations in the application of immunohistochemistry in the prostate: report from the International Society of Urologic Pathology consensus conference. Am J Surg Pathol. 2014 Aug. 38(8):e6-e19. [Medline].